A Winnipeg lawyer has lost an appeal after being found guilty of professional misconduct in connection with a residential school survivor case. A Winnipeg lawyer who said he failed to respond to emails because they ended up in his spam folder has lost his appeal of a professional misconduct finding against him. 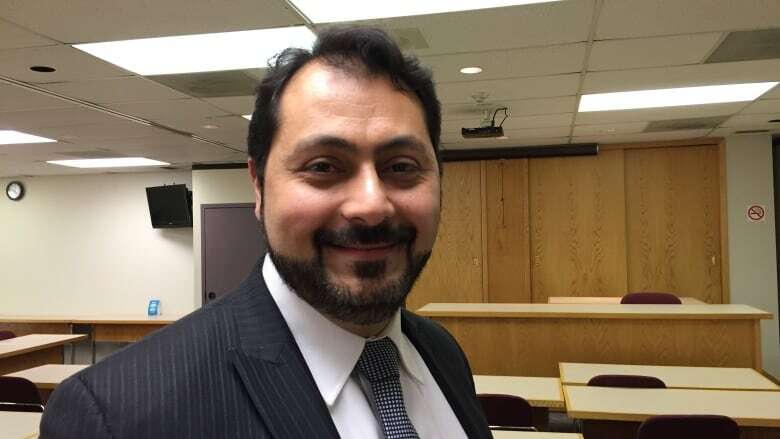 The Law Society of Manitoba reprimanded and fined Louay Alghoul after finding him guilty of professional misconduct for failing to respond to a series of emails sent to him by an adjudicator overseeing residential school survivor cases. The lawyer appealed that decision in December. On March 8, Justice Michel Monnin of the Manitoba Court of Appeal decided to uphold the law society's original punishment, saying that Alghoul did receive the emails sent by the adjudicator and that the society's finding of professional misconduct was reasonable. Alghoul appeared before a Law Society of Manitoba discipline panel in 2016 after he failed to respond to four emails over a six-week period from adjudicator Carolyn Frost about his client's compensation claim for abuse at a residential school. Alghoul told the panel those emails ended up in his spam email box when his company switched email addresses from a ".ca" address to one ending in ".com." "I have been a very good lawyer," Alghoul told CBC News, saying he has worked hard to earn his reputation. "I've helped so many survivors in residential school cases and it's not right to tarnish my name because of four emails sent to the wrong email address," he said. "Having received [the emails] in my junk email box is not the same as receiving them," said Alghoul, comparing it to a personal letter being delivered to a neighbour. Alghoul said he apologized to Frost, noting she did not follow up on the emails. He said if the adjudicator had contacted him in any other way, he would have responded immediately. The responsibilities of adjudicators in residential school survivor compensation claims include work such as hearing testimony of claimants, rendering compensation decisions, and reviewing legal fees to make sure they are fair and reasonable. Under cross-examination, Alghoul told the discipline panel he did respond to other messages sent to his old email address, but those messages did not end up in his spam email box. He also was paid his legal fees of about $15,000 in 2013, despite the fees not being reviewed by the adjudicator due to lack of information requested in the four emails. The information needed to approve the fees was not given to Frost until March 2014. Frost said she had no concerns about the amount Alghoul received in legal fees. Alghoul testified he has handled about 650 residential school claims and said the problem was an isolated incident. The discipline panel did not agree and fined Alghoul the cost of the proceedings (about $28,000) and issued an official reprimand. Alghoul appealed the findings on Dec. 12, 2017, saying "if his conduct was discourteous or disrespectful, it was not serious enough to warrant a finding of professional misconduct," according to the decision rendered by Monnin. "As for the penalty imposed, the respondent contends that a reprimand was too harsh for minor breaches of civility rules." Alghoul also said due to an alleged error by the discipline panel, the time needed for the hearing increased dramatically and "that he should not bear these additional costs." Monnin ultimately rejected Alghoul's appeal, stating that Alghoul did receive the emails and the panel was within its rights to reject Alghoul's explanation for missing them. Monnin also found the Law Society of Manitoba's finding of professional misconduct reasonable. "The adjudicator's evidence was that she sent the respondent four email messages requesting information that she required to conclude a legal-fee review," Monnin wrote in his decision. The adjudicator also testified that due to the lack of response, she received Alghoul's time records five months late, did not receive other requested information and could not complete a review on the fees he charged, wrote Monnin. He then agreed with the Law Society of Manitoba's assessment that Algoul's lack of response was a "failure to treat a tribunal with candour, courtesy and respect and that it interfered with the adjudicator's ability to conclude the hearing." Alghoul told CBC he is considering taking the case further, saying he has spent tens of thousands of dollars in lawyer fees for his defence, and said losing the appeal opens the floodgate to liability for professionals. "You are telling professionals that if you receive an email [in your spam box] … there is no duty on the sender to follow up and to make sure that your message is received."